Blue Sapphire And Diamond Ring made in14k White Gold (1.43ct BS) . See Specifications for more details. ..
Blue Sapphire And Diamond Ring set in 14k Yellow Gold ( 1.4ct Bs) One cool blue sapphire in prong setting with ten round .. 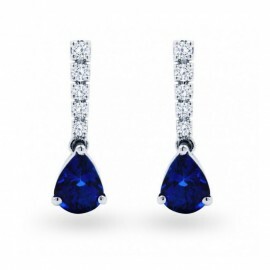 Double Halo Blue Sapphire And Diamond Earrings In 14k White Gold (0.75 Ct) See Specification..
Blue Sapphire And Diamond Earrings made in 14K White Gold(1.95ct Bs) See Specifications for more details. ..
Blue Sapphire And Diamond Ring set in 14k White Gold ( 1.4ct Bs) One cool blue sapphire in prong setting with ten round diamonds, in..
Blue Sapphire And Diamond Ring set in 14k White Gold ( 2ct Bs) Intricate in design, this sapphire and diamond ring showcases eight diamond..
Blue Sapphire and Diamond ring set in 14K White Gold (1.75ct Bs) See Specifications for more details. SHIPPING DET..
Blue Sapphire Bracelet made in 18k White Gold ( 21.67cts Bs) See Specifications for more details. SHIPPING DETAI..
Blue Sapphire Bracelet made in 18k White Gold ( 6.25cts BS) See Specifications for more details. SHIPPING D..
Blue Sapphire Bracelet made in 18k Yellow Gold ( 21.67cts Bs) See Specifications for more details. SHIPPING..
Blue Sapphire Diamond Bangle made in 14k White Gold(2.7ct BS) See Specifications for more details. SHIPPING DETA..
Blue Sapphire Diamond Bangle made in 14k Yellow Gold(2.7ct BS) See Specifications for more details. SHIPPING DET..
Blue Topaz Diamond Bangle made in 14k Yellow Gold(2.7ct BT) See Specifications for more details. SHIPPING DETAIL..